Would you like to dive or swim in a sea…full of rubbish? We certainly wouldn’t, and we’re sure you wouldn’t want to, either! We feel a very strong bond with the crystal-clear, uncontaminated sea off our coast, with Orosei, with the whole Cala Ginepro area and, indeed, with the whole island of Sardinia. At Camping Cala Ginepro, all waste must be sorted and taken to the campsite’s recycling area, which should only be accessed during specific hours. The dedicated staff will provide you with all the information you need and will show you how to sort your waste in compliance with the guidelines set out by the local council in Orosei. The problem of waste is becoming increasingly significant and increasingly worrying. The ecosystem of land and sea has been altered because mankind has produced massive amounts of waste that has not gone on to be recycled. We want to do our bit to say “STOP” to this senseless way of living life and living with nature. We believe in ecology and we want to protect Cala Ginepro. For this reason, we pro-actively support the safeguarding of the environment, through measures including the sorting and recycling of waste. Being “green” is a must, even on holiday. 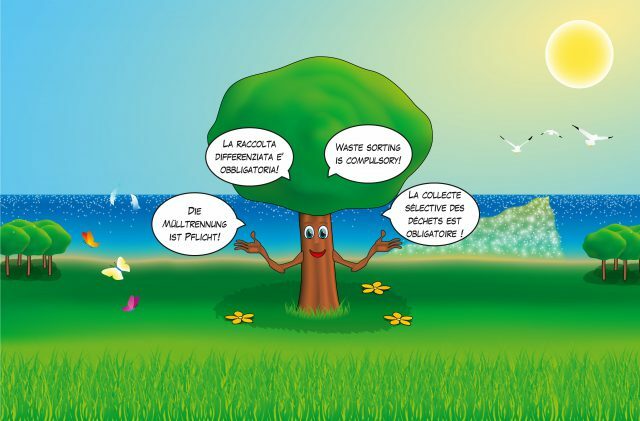 At Camping Cala Ginepro, waste sorting is compulsory for everyone! At Camping Cala Ginepro, sorting your waste is compulsory and essential for numerous reasons. Here are 3 good reasons, which we feel are the most important. If the waste is not properly sorted, it is not uplifted from the campsite by the waste-disposal companies; this causes a serious hygiene problem that brings with it an ethical issue of social injustice – i.e. some has to end up sorting the waste of those who refuse to do it. As such, we demand that all waste be sorted before disposal, as described in all of the brochures given to you on your arrival, and on the signage. Take care: the instructions provided by Orosei local council may be very different from those in your city or country, so please follow the instructions that apply here - explained in the depliant we give you - even if they differ from those you are used to. In actual fact, the system is simple: when you generate waste, you simply dispose of it in the proper container, as indicated in the informative material. Waste sorting makes it possible to recycle the waste. This means that through a process of conversion and transformation, the waste that we generate can be used to create new products: an excellent alternative to the classic (and highly polluting) solution of landfill! For example, recycling paper makes it possible to avoid the felling of new trees. Recycled plastic and aluminium can be used to make a pair of spectacles or…a watch suitable for sub-aqua diving! Recycling glass means less recourse to landfill, and it also means that only one-third of the energy is required that would be needed to make the product from scratch. The recycling of organic material produces compost, which is used as fertiliser or loam in place of chemical fertilisers, with a considerable improvement in the quality of the soil – and our health. In short, recycling waste is quite simply essential! Supporting an ecological commitment with real actions is something we have to do for our children and all those who will come after us. Rather than destroying nature and our surroundings, it is crucial to protect them and to behave responsibly. Only in this way can we do more than hope – we can actually do something tangible to protect nature and live in a better world. The Earth’s resources are not infinite – on the contrary, they are decidedly limited! Waste sorting is a crucial part of the effort to protect the whole planet. Sorting and recycling our waste it a small gesture, but one that is exceptionally important. We must do so for a better future and in order to ensure that we can enjoy holidays that respect the bounty that nature has given us.